Allows the Physiological Pressure Transducer to be mounted or clamped onto a stand. Range of wireless and wired accessories for Equivital solutions. A Langendorff Transducer Accessory Kit, which is included with and for use with the Langendorff Systems. A set of four gas diffusers suitable for use with 2, 4 and 8-chamber Panlab Organ baths, and the Langendorff Apparatus & Thermostat Controller. For use with the Differential Amplifier with Active Headstage. 10ft extension cable designed to connect the MPVS-Ultra Pressure-Volume Unit (large and small animals) to the Ventri-Cath series animal pressure-volume (PV) catheters, both from Millar. Adapters that connect corresponding pH, ion selective or oxygen microelectrodes directly to a PowerLab BNC or DIN input. 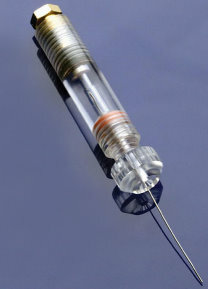 Includes a Hamilton LR (Luer tip) Glass syringe (250 µL) and Repeating Dispenser. 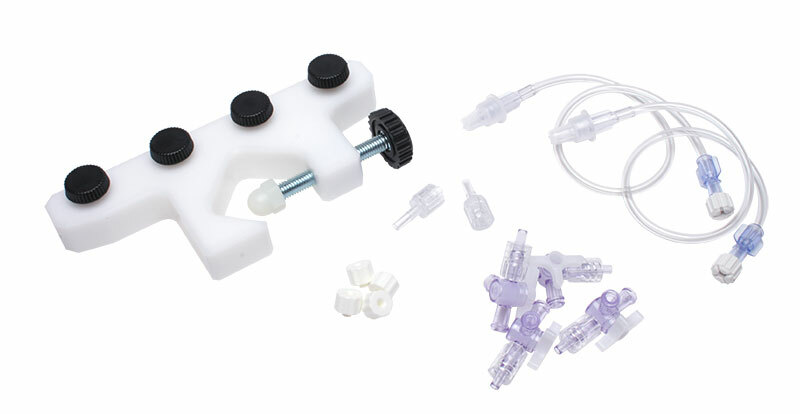 The Rho Calibration Cuvette is used to calibrate Pressure-Volume catheters using the MPVS Ultra Pressure-Volume unit from Millar (for large & small animals). Allows front-end units to be connected to a PowerLab unit up to a distance of 1.8 m.